A big thank you to everyone who commented on the Laburnum shade. (Gosh, you make us blush.) I've got Joel working on a little video of the construction to completion phases of the shade and hopefully, we'll get something put together soon. He sets up a time lapse camera, edits the footage and the results are pretty neat. I wish we could work that fast in reality! We managed to get a fairly decent photo of the Laburnum on Sunday night. What really helped was when Joel came home and took over the photography session. He knows his camera inside and out better than we do. With the two guys working together, things went much better. By 2AM Sunday night we had the CD burned, labelled and packaged along with our quilt panel submission for next year. On Monday morning I was in the parking lot of the post office waiting for them to open up so the package could be sent as soon as possible to Gig Harbor, Washington. It's on the way, now all we do is wait. Voting starts in March (I think) and then if your photo is selected, you are notified by mail. I can only imagine how much work is must be to receive hundreds and hundreds of these photo submissions from all over the world and get them organized and ready for voting. And after the voting, all the notifications to write and who knows what all goes into actually producing a calendar. I'm sure I'd be stunned if I knew all the details involved in that massive undertaking. I bet putting the quilts together with all of the submission panels is another gigantic job, but every year, we're amazed at how beautiful the finished product is. I'd love to see them in person some day. 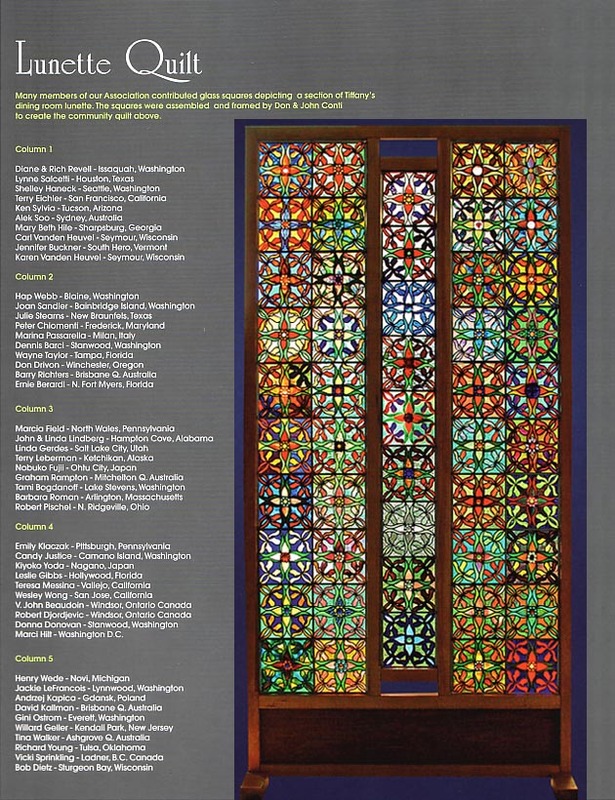 I am including a link to the Association of Stained Glass Lamp Artists website where you can view the calendars, the quilt panels, and the history of this wonderful organization. And you can also purchase a calendar from them or join the membership. Our good friend Larry from Conrad Art Glass and Gardens introduced us to the association, and we're so glad he did. 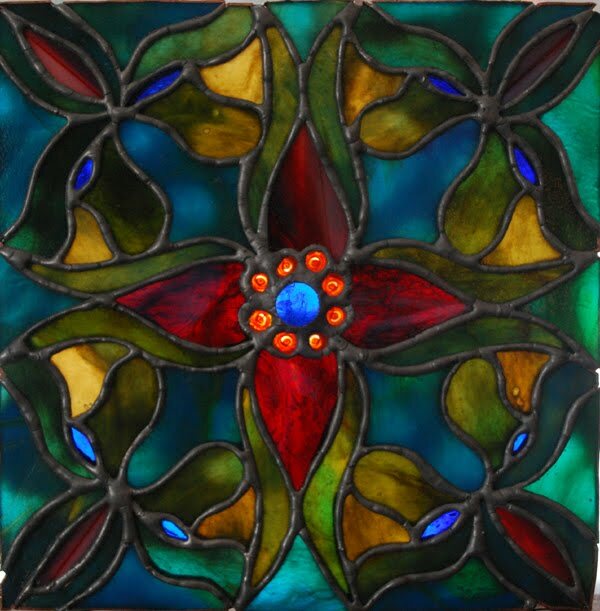 If you are not familiar with Larry's blog, please do go and treat yourself to his fine photography, beautiful stained glass works and last but not least, the exquisite garden he tends with his lovely wife, Sarah. January is going by quickly. We both looked at the calendar the other day and suddenly realized just how few days are left in the month. Can it be only that few? Oh-oh. We have some homework due by February 1. When the kids were in school I used to yell at them about putting off assignments til the last minute. "What do you mean you need a costume, a 3-D replica of the solar system and six dozen cookies by tomorrow morning?! How long did you know about this?" They would hang their heads sheepishly and say, "About a month." "A MONTH?! You knew about this for a month and I'm first hearing about it NOW??" But I would try to make the deadline, pulling out all the stops. And my hair. And I dragged them right along with me; I wasn't going to suffer alone. "There, we're done, and look, it's only 3AM," I'd say out loud to no one but myself since the culprits were fast asleep. 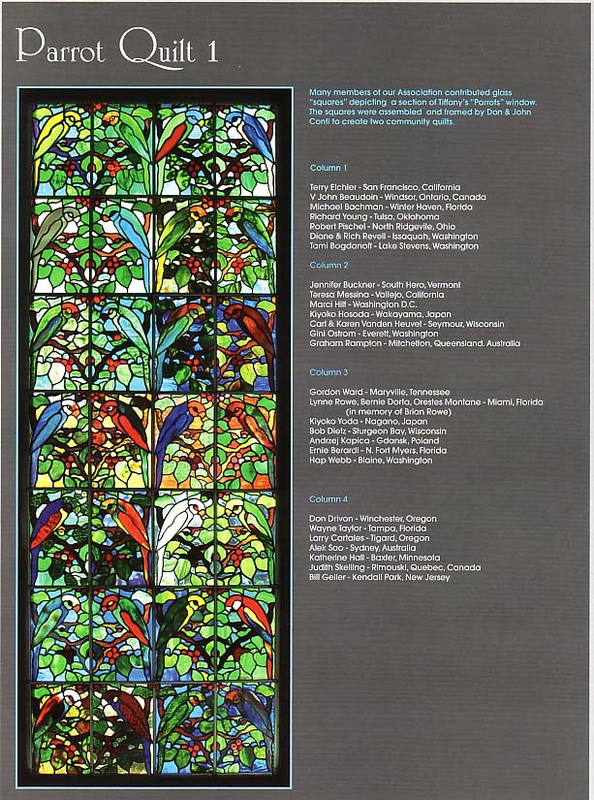 Every year we submit a picture of one of our stained glass lamps to the Association of Stained Glass Lamp Artists for their annual calendar. People from all over the world belong to the Association and there are usually well over one hundred photos of lamps sent in for consideration and voting by the membership. We've been lucky to have a lamp picked the last five years in a row which is a really big honor. 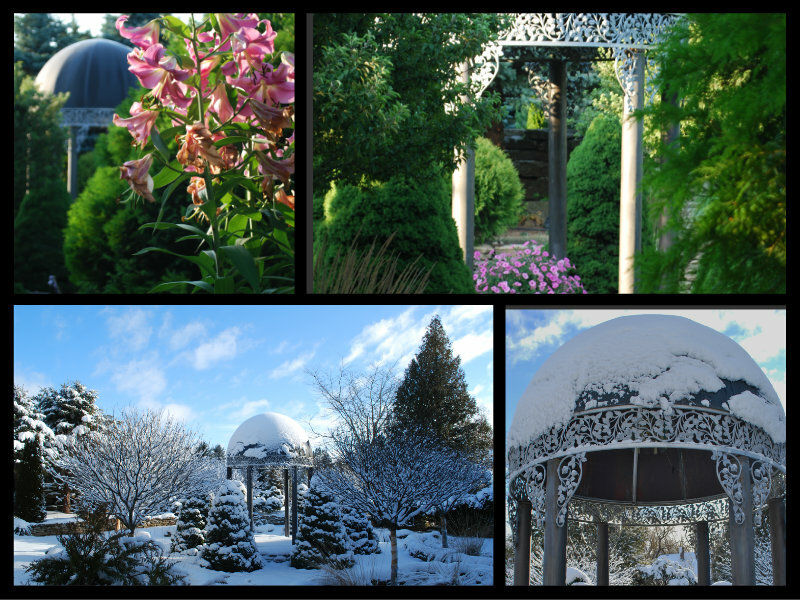 For the 2013 calendar, our Rosebush shade was selected for December. We were amazed. Submissions of photos for the 2014 calendar are due on February 1. Ummmm.....suddenly I feel about as sheepish as our boys did so many years ago. Gosh.......I wonder where their procrastination tendencies came from? Surely not from their Parental Units. Photographing a lamp is an amazingly difficult thing to do. We take hundreds of photos (thank goodness for digital photography) and agonize over camera settings, lighting, shadows, hot spots, glare, position of the shade, which side to feature and on and on. Just like a Super Model, we have to go over the make up several times. So, here we go again....we're trying our best to get a good photo of the latest lamp to be completed, the Laburnum. 1,986 pieces of fun. There's Carl today, working on the lighting and details. Here's a photo of the Iris after all the fuss and bother a few years ago. 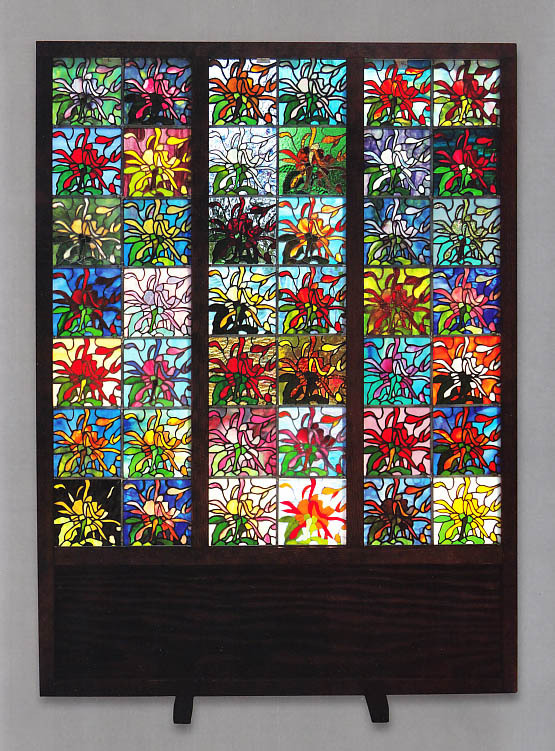 Along with the calendar photo submission, the Association also has an annual stained glass 'quilt' put together of submissions of panels from the membership. We had our panel done well over a month ago but it, too, is due in Washington state by February 1. This year's theme is 'Clematis', and here's our submission. Every panel sent in is put into the Quilt, and when they are all joined together, it's glorious. 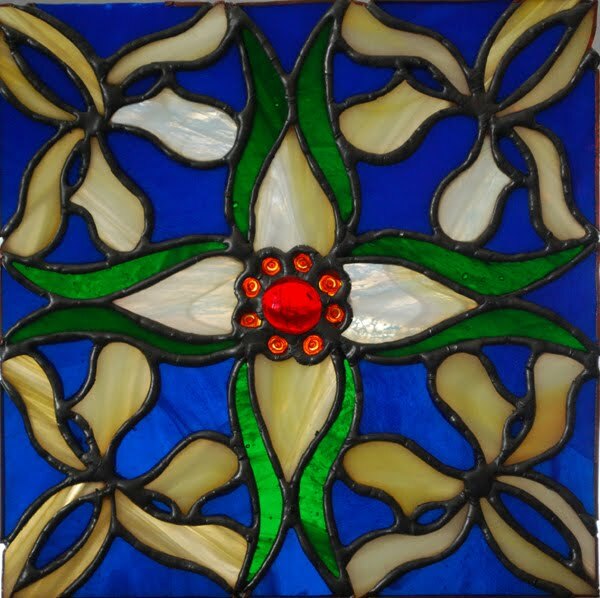 I have a lot of fun making these quilt panels; we have scrap glass in abundance and this way it is put to good use. But if I don't get this thing in the mail by tomorrow, it will be past the deadline for the quilt. So, looks like we'll be burning the midnight oil again, since Carl's taken over three hundred photos already and none of them are 'it'. Here we go again. I owe our sons an apology. The Procrastination Gene was definitely inherited. But at least we don't need a 3-D Solar System and a costume. Six dozen cookies sound good about now, though. Yours truly did something really silly yet again. Yep, I tried bouncing one more time. When will I learn? On Thursday afternoon, our frigid weather finally broke and we were at 10 degrees above zero. The dogs hadn't had a decent walk outside in two days so they were more than willing to have me put their little winter coats on (yes, I'm one of THOSE people) and headed out the door with doggie glee. I was ultra-careful on this walk as there are scattered ice patches here, there, and everywhere since our January thaw. Once we hit the deep-freeze this past week, the ice seems to have acquired a highly polished texture, absolutely treacherous for unsuspecting pedestrians be they animal or human. Two of our hens were walking down the path the other day and first one and then the other went down on their feathery behinds. The dogs have a hard time with their balance, too. So I was very cautious, only picking spots that I knew weren't icy. All went well, the dogs and I made our lap around the Back Eight in fine form. Teddy was sniffing around under every tree for whatever it is dogs find so fascinating and Pudding was running back and forth on the trail like she always does, sometimes way in the lead and then coming back to me at top speed only to turn around and take the lead again. She puts on double the miles Teddy does. I clipped a pedometer to her little coat last year and found that she takes six steps to one of mine. Of course, her legs are only four inches long. Mine are a little longer than that. On the way back from our walk, I found a pop bottle lying in the field that must have blown in from somewhere. I stuffed it in my pocket, intending to put it in the recycling bin. As we walked by the chicken coop, I decided to see if the Girls wanted to come out and enjoy the sun, too. We had put a heat lamp in the coop during the frigid weather and it has kept the temperatures from dropping too low, but I knew the chickens missed their freedom. I opened the door and the hens came tumbling outside, clucking happily. As long as I was there, I gathered the two eggs that had just been freshly laid and proceeded to the house to let the dogs in. I had the two eggs in my right hand and had to get the house keys out of my pocket with my left hand. That's when I remembered I had the pop bottle in my pocket. The recycling bin was right outside the garage door, so I got the keys and the bottle out at the same time and proceeded to toss the pop bottle in when WHOOOPS.....my feet went right out from under me. A small patch of ice was my undoing. I'd let my guard down. I know it's a tired cliche, but It All Happened So Fast. Unlike the hens with their feathery behinds, I didn't land as softly. I wish the fall was on video, because it was a doozy. Somehow I managed to hit my left knee, right elbow and right hip all on the stone pathway at the same time. One second I'm standing on my two feet, trying to do my patriotic duty by recycling a recyclable and the next minute I'm lying on my driveway staring up at the sky with two worried dogs milling around me. Groan. Remember when I bought Mom that Freedom Alert monitor to wear around her neck? Well, it appears I'll have to buy one for me, too. I'll have to call my 92 year old mom to come rescue ME. I apparently cannot be trusted to remain upright throughout an entire winter. Ten years ago I broke my right wrist by slipping on the last remaining patch of ice in the state of Wisconsin in the spring of the year and ever since then, I've had a healthy respect for the stuff. Ok, Fear is the operative word. Just as I was gingerly hoisting myself up, testing if my appendages were all going to function normally, my cell phone rang. It was my friend Ann, just calling to chat before she went to work. "Hi, how's your day going?" she asked. "Oh, ok, I guess, I just fell down and now I'm getting back up," I said. "Ouch." Poor Ann, she knows me so well. "OH, no! Not again! Are you ok?" "I guess so," I muttered, moaning. "I have to see if I can walk yet. My hip is really hurting. I'm just going to let the dogs in the house first....oh, wait....where are my keys?" Apparently, when I slipped, I launched everything I'd had in my hands. I found one of the smashed eggs about ten feet from the accident site. Two of the hens were walking around the egg, looking disgusted. They go through all that work, and I just throw their eggs around. Surprisingly, the stupid pop bottle had made it into the recycling bin, but the keys were nowhere to be found. I hobbled around in circles, whining to Ann, and almost gave up when I finally spotted my keychain about thirty feet away behind one of the urns where they'd bounced off the garage door. The other egg simply disappeared. It's probably still in orbit, waiting for me to walk out of the house. Splat. My hip was simply throbbing, and I realized something in my pocket had taken the brunt of my fall. Yes, my pedometer. Oh, what a sad day for us both. I've had the thing since 2008 and it has faithfully recorded all my steps all these years. It's one of those cool ones that allows me to upload data to my computer and keep records of all that walk, walk, walking with Leslie and on my own. This poor unit is with me from the time I get up til the time I go to bed, keeping me honest about how much I really walked. And how did I repay the favor? By squishing it to death. Awwwwww. When the guys came home from work, Joel took the pedometer apart to see how badly it was wrecked. Besides destroying the case and the LCD display, I even bent the battery inside the case.......sheesh, I REALLY need to lose more weight. We hoped to be able to download the data stored on it, but alas, the entire unit was toast. I only lost ten days of information, so no big deal, but it was like losing a friend, in a way. Luckily, I had bought a new one just like it earlier this year, anticipating the old one would eventually quit working, so I'm back in business again with my step counting. But I sure do feel bad about the old one. I'm stiff and sporting bruises in places best left unspoken of, but Leslie and I kept our date this morning, so I'm none the worse for wear. When I broke my wrist, the doctor said I had really good bone density which meant my coordination is to blame, because when I fall, I don't mess around. I Really Fall. Hard. Crash, bash and smash hard. I am going to dig around in the closet for the spring-things I clamp on my shoes to prevent slipping on ice. I don't know why I didn't think about those things earlier this year. Mom reminded me I own some; I gave her a pair a few years ago and she wears them all winter. She said she'd lend me hers.....I said, "No, Mom, you keep yours. But I may be asking to borrow your personal alarm button." I have officially proven once and for all that this middle-aged woman does not bounce. Let's hope this puts an end to my experiments. Wish my new pedometer luck. Not exactly a hot seat, is it? Oh, doggies, it's cold outside! I gave Teddy a haircut just before the cold snap. Bad idea. Normally Wisconsin has a temporary thaw around January 20th. We had our thaw much earlier this year by almost two weeks. Almost all the beautiful snow we were blessed to receive in December has melted except for the drifts in the road ditches and along the line fences here on the farm. I'm done cross-country skiing until the next snowstorm. On Thursday night the forecast calls for three inches of new snow. I sure hope so. After our early thaw, the ground is unfortunately bare in most places. And since Sunday night, the temperatures have plummeted below zero with a -20 degree windchill. I'd be a whole lot happier if we could have kept our snow cover, but I think we'll be ok as far as garden plants go. I'm writing this on Wednesday night and the brisk west wind buffeting the house is clipping along at 13 mph making the TV antenna on the roof bounce around. Every time the wind gusts hit the antenna, we lose reception which, I guess, isn't such a big deal since most of the shows aren't worth watching anyway. But don't you hate it when the picture locks up on the TV? And why aren't the commercials affected?? Oh, well, I turned the TV off. The pictures I'm sharing in this post are all of the snow we had earlier, which was extremely powdery in nature. I don't know why this dry snow stuck to the trees as well as it did, but it certainly clung to every surface tightly. Carl and I had to go out with brooms and shovels to whack the snow off of the smaller trees to keep branches from being broken. Some of the miniature conifers were bent nearly double under the weight. The snow we didn't remove was still on the other trees for at least two weeks or more. The dry, powdery nature of the snow was really evident when I took an impromptu break from skiing one day. I was out there just step-kick-gliding myself silly when all of a sudden I lost my balance. Since I know the dangers inherent in trying to save myself from a fall with six feet of boards strapped to the bottom of my feet (flailing around doesn't help much) I decided to simply tip over sideways. The landing was very pleasant, foof, down I went into about two feet of drifted snow bank. It was a sunny afternoon and the sky was a brilliant blue. There were two hawks way up high, riding the breeze in ever-widening circles. Funny how the world looks so different when you're laid out flat. I never noticed before just how hilly this old farm really is. I was completely out of breath when I'd fallen, so the rest was welcome. As I was lying there, resting up for the fight to regain my feet again, I noticed the hiss of the snow sifting around me in the slight breeze. My little break must have lasted longer than I thought; I was surprised to see my right arm was almost completely covered by a small drift. Maybe they'll find me in the Spring? The sight of my rapidly disappearing limb and the fact I was starting to melt the snow under me prompted me to burn about two thousand calories in the struggle to stand up again. I know, I could take my skis off for this, but hey, where's the fun in that? There is no exercise in any gym that can compare to trying to get your skis uncrossed causing great bodily contortions and distortions while you try to get the ski poles under your arms and finally, hoisting yourself back on your feet again, especially when the skis slide out just as you're halfway up. (It's a good thing I've never taken up downhill skiing.) So, that was the last time I was out skiing this winter but I'm hopeful there will be another opportunity. The Girls aren't too fond of the snow, so when the thaw came, they were much happier. They follow my snow blower trails all over the garden. Two of them decided to molt. I don't know why some chickens lose their feathers in the winter. It would make a whole lot more sense in the spring. But it's amazing how fast the new feathers came in. Speaking of snowblowers...we bought a new one this fall for the 574. For years and years we talked about having one for the tractor and finally took the plunge. Even though we haven't had a lot of use for it yet this year, we're glad we did. Tuesday was an epic day around here. I woke up to the magical sound of the sump pump alarm shrilly blasting away in the basement. Down the stairs I went and was relieved to find it was only water running across the floor from the pressure tank which is right near the floor drain. At least we weren't knee deep in water! The pressure tank had sprung a major leak. I turned off the sump pump alarm (wow, that thing is LOUD) and realized I'd just found the reason why our well pump had been cycling on and off for weeks on end. We've been having problems with the well lately. Back in November, we pulled our well because the pump kept running. The pump sits at the bottom of the 80' deep well, so we had to take the cover off the well and with Joel on the end walking backwards eighty feet, Carl guided the casing out of the pipe until the well pump was on the surface. It turned out the check valve in the pump had worn out, and anticipating this before we pulled the well, Carl installed a new valve we had purchased earlier in the day. It took about an hour and a half to pull the well ourselves and replace the part. Then comes the fun part of putting the pump back in the well. My job was to clean the casing as it was lowered back down....and I was really kept busy with cleaning it with hot water and cleaning cloths as fast as I could manage. The well is heavy and it was getting dark and cold out. The hardest part was trying to get the well cap to seat in the right direction to line up with the pipe going to the house. Joel was helping Carl hold the weight of the well assembly while they were trying to figure out why the thing wouldn't hook up correctly. I was supposed to hold a flashlight and try to shine the beam down the six inch hole so they could see what they were doing since by now, it was fully dark out and around 25 degrees with a brisk west wind. I had to kneel about two feet from the well casing so my body would be out of their way somewhat and still aim the flashlight at the right angle so they can see what they are doing. My part sounds easy, right? Well, it was, but since I can't see what they are looking at and Carl is straddling my arm with his leg and trying not to hit me in the head with his elbow, needless to say, the flashlight beam was off kilter more than on target and we weren't making a whole lot of headway. Tempers flared. Thankfully, after another twenty minutes of twisting, turning and kabitzing, the job was done. Phew. After we were done, we hoped the well would stop cycling on and off for no reason. For awhile it did appear we'd solved the mystery and fixed it by replacing the check valve. But in the last two weeks, the well was starting to run again, on and off, when no water was turned on in the house. We were worried. The last time we had to yank the well pump was in November with the temperature in the 20's. Yesterday was nine below zero. Oh, I was REALLY hoping we wouldn't have to pull the well in this weather. I made my way through Carl's work room (an adventure fraught with danger since Carl is not exactly tidy) and then found myself in front of the switch box. I wanted to turn the breaker for the well pump off. This was no small feat, since the breaker box is a mislabled nightmare. When we built this house in 1978, the electrician was a bit of an eccentric apparently; there are light switches mixed up in every room in the house. If you flip the switch on the right side, the light on the left side of the room lights up. The one in the middle turns on the yard light and the one on the left turns on the dining room light on the right side of the room. Either our electrician was drunk or he just enjoyed seeing his clients confused, I'm not sure which. (I often wonder about people who make viruses that infect computers, too...I mean, what joy do they get out of making people's computers sick? They aren't actually physically there to see people wringing their hands and fretting, so what's the big attraction?) And along with weirdly wiring our abode, it was his job to label the breakers in the box. Oh, boy. He didn't make any more sense in the labelling department either. And over the years, Carl's added his own labeling system that I just don't get. He's crossed stuff out and written stuff in and it's a jungle in there. According to the handwritten sticker on the lid of the box, the well pump breaker was number thirteen. Ok, that's great, except there is no breaker installed in the number thirteen slot. I tried fourteen, fifteen and sixteen, and after turning off the lights in the basement and who knows what else, I finally found the right one. At least the well stopped pumping and the water stopped squirting all over the place. I called Carl at work, but he was in a meeting. Remembering that I was also supposed to shut the electric hot water heater off if the well wasn't running, I went back to the box and tried to decipher the hieroglyphics scribbled on the sticker one more time. I finally located what I thought was the hot water heater and trudged back upstairs. Ok, no big deal; no water in the house until Carl can fix the problem. Not a tragedy by any means, I had two gallons of water in the fridge. This wasn't like when we were farming back in the day.....not having water then was a Big Deal. We had to haul water in milk cans from the neighbors to water the cows with milk pails. Cows drink a LOT of water, up to 20 gallons a day, so we made repeated trips in frigid weather to slake their thirst. And then the well had to be pulled up out of the ground and defrosted. I remember those awful days so well, and always in the most frigid January weather. Dad used to leave a kerosene lantern burning in the pump house in an effort to keep the water lines from freezing. On a day when nobody should be outside, we'd be pulling a well up and out of the ground. Ah, good times. Anyway, back to Tuesday. As I said, the temperature was very cold, down to -9 below with a steady west wind and -25 windchill. After folding some laundry, I felt a bit of a chill. The furnace was running steadily and yet the temperature in the house was going the wrong way. Down. The blowers were running and though the thermostat was set for 67, the actual temperature was 62. We have geothermal heat and this is the first time this has happened, but again, this is the first time we've had such cold temperatures since we installed it in 2009. Carl finally called me back and said we'd have to install a new pressure tank when he got home from work. "This is really good, actually. At least now we know why the well was running! Maybe we won't have to pull the well again this winter after all." Only Carl can find the silver lining in every situation. When I asked him about the furnace, he was stumped. By that time, the temperature was down to 60, though the furnace never shut down. There's an auxiliary electric backup unit on the furnace, but we'd never used it and I didn't want to touch it unless he was here. I just put on a coat and walked five miles with Leslie in the living room which kept me nice and warm. By the time Carl got home at 4PM, the house was down to 54 degrees. I will admit, that is a bit chilly. We were both worried about the furnace more than anything. The pressure tank replacement was going to be a big job, but what if the furnace was out of commission? Carl decided to turn on the auxiliary heat for the first time. As soon as he did, the smoke alarms started going off in the house, since there was dust (yes, I'll admit, I didn't dust the heat-thingy) and apparently some paint that had to burn off the coils. Once we got the smoke alarms settled down, Carl tried to figure out why the furnace wasn't putting out any heat. Turns out, the problem was with me and the switch box. When I turned off what I thought was the water heater, I had actually turned off the compressor for the furnace, so yes, the fan for the furnace blower was running nonstop, but was only circulating cold air through the house since I turned off the heat source. (I am brilliant.) Once Carl switched the compressor back on, we had heat again. In about four hours we had the heat back to normal. Carl set to work on taking out the old pressure tank for the well and replacing it with the new one. I was in the way in the small space and went upstairs to make supper, but was in earshot so I could gopher for him if he needed anything. After an hour, he had the pressure tank in place and plumbed. When the water was turned back on though, another pipe sprunk a leak. We had to turn the water off again and head to a big box store for more plumbing parts. By this time it was 7PM and still bitterly cold out. My car barely started; I think it's time for a new battery, but one dilemma at a time, please. I drove since Carl's hands were so full of plumbing compound and yucky goo and we still had no water to wash with. When he got to the store, he cleaned up while I cruised the fascinating plumbing aisle. Armed with a small arsenal of assorted pipes and fittings, we sallied forth for the hut one more time. Carl had to start all over from square one, but by 10:30 PM, we had Success. Running water and a working furnace.....wow, what more can you ask for? You never miss the water til the well runs dry or the heat until it's 25 below. And I shouldn't take Carl for granted, either. But we really do have to relabel that pesky switch box. It's January 11th already, wow. I sure wish I knew how it is that time can go so quickly at some points and so blasted slow in others. Like for instance, how quickly time flies when I'm enjoying a delicious ice cream sundae. Zip, it's over. But then how slowly time can go by when I'm trying to hold a plank position for 60 seconds. In no time flat the ice cream is gone, but when I'm down on the floor, up on my toes and elbows, trying to keep my torso from sagging and staring at my kitchen timer willing the seconds to fly by, they crawl along in s....u....p....e...r...s........l.......o.........w.....m.....o.......t......i...o...n.
I never made New Year's Resolutions in the past. Mostly because I knew I wouldn't keep them and then I'd feel guilty. Since I don't need any more guilt in my life (such a waste of time) I decided resolutions were not gonna be part of my life. Some of you may remember when I fell down a flight of basement stairs on my ample derriere back in December of 2011 and bruised more than my behinder? And then I discovered I weighed a whole lot more than I realized...another area where time and possibly, just possibly, a few too many ice cream sundaes got the better of me. Ok, so there's a lot of pictures of the Quarry, but all the shades of blue amaze me. More than a bit depressed, and wandering aimlessly around in a video rental store on New Year's Day 2012, I found myself in the 'Health and Fitness' DVD section and there she was, Leslie Sansone smiling from the cover of a beginner's walking video. And it was free; just bring the DVD back in five day's time. Well, that was the start of the regular exercise. My tailbone was too sore to sit and the only thing that felt sort of good was walking, so walking it was. I lost forty pounds in about eight or nine months. And then hit a plateau. Flash forward to January 2013. Yes, I'm still walking. And a whole bunch of other stuff. The time just keeps flying. Below is a 'part' of my collection of DVDs. Our son Dave was home the other day and stopped next to the stack of fitness gurus piled up on top of the TV cabinet. "What the.......are these all exercise DVD's??" he asked. "Do you think you have enough now?" Ok, so I admit I'm a little OCD. Since the plateau, I did some reading on what to try next. Weight training is beneficial for health and for strengthening bones as I age. So, I've tossed in weight training three times a week, Monday/Wednesday/Friday with the 'New Rules of Lifting for Women' book trying to hoist some heavy metal around and increase the weights lifted as I go along. I'm in Stage 2 of a six stage program which should take six months, more or less, depending on how things go. I'm taking it slow and repeated the first stage twice since we all know that grace ain't my strong suit. I did a stupid thing at the beginning of the weight training; I held my breath and lost my form whenever the lifting got tough as I tired. Now I know better. The massive exertion headache was enough of a deterrent to remind me to BREATHE. Now I sound like a steam engine puffing away, keeping the air moving. Then I found a DVD by Debra Mazda, 'Let's Get Moving 2' and three times a week I use her incredible routine for a warm-up before going upstairs and lifting the iron. The lever gym from Craigslist is being put to good use, too, I'm glad we bought it along with all the free weights. I'm constantly adding to my free weight collection. We found another 50 pounds of assorted weight plates at Goodwill for a very low price. So many exercises, so little time. Holley from 'Roses and Other Gardening Joys' blog suggested I try Callanetics, (thank you, Holley!) and I'm definitely seeing results. Subtle, but they're there. Callanetics is definitely different than anything I've ever done before. The exercises don't look tough, but they are. Great for posture and for toning, amazingly effective. Callanetics was popular in the 1980's but is making a comeback. Building my strength is taking almost as long as building Aaargh. Sheesh. So, what have I got to show for all this work? I wish I could say I'm getting skinnier. Such is not the case. In fact, the scale is going the opposite way by a few pounds. Yep, that's right. Up. I don't like it, but what's a mid-fifty something woman supposed to do? I've been doing research into calorie calculators and have recently adjusted intakes of protein and carbs and fats and blah, blah, blah. I increased my caloric intake back in September and didn't gain any weight which is a good thing, but I have gained weight since starting seriously lifting weights. I guess it's normal, water retention and so on and so forth. I'll just have to play this game with the calories and see where it leads next. Never took a picture of myself before, so vain! But there's the latest view of the poundage still sticking around. I've got a long way to go! Since gardening isn't an option this time of year, I've returned to the next best thing for outdoor exercise: cross-country skiing. This year we'd been blessed with snow and I've been taking advantage of the wonderful exercise an hour a day at least three days a week. There's no better way to enjoy a Wisconsin winter. The cold, crisp air lifts my soul. There are so many different shades of blue in the winter shadows. This old farm is my playground, around the acreage and through the Back Eight. Sometimes little Pudding dog comes along, walking carefully in the narrow track of one ski. But last night the temperatures started coming up and we had rain. My snow is melting. I'm one of the weird ones who wants to see snow on the ground in the winter. Nothing better for our plants than an insulating blanket, because it will turn cold again. After all, this is only the start of January. There's a big contrast between July and January in Wisconsin. I vow to post more often before the seasons turn. I wish I had more time to blog and visit blogs. I miss it more than I can say, but with doing all the exercise and the usual cooking/cleaning/life stuff and trying to get to bed at a fairly decent hour (which I'm still struggling with which is probably another key to why I can't get where I want to be, since rest is also very important) something has to give. I should be ordering seeds by now and haven't given it a thought. And Leslie always says she'd rather have a messy house and a fit body, and I can tell ya, this house is definitely messy. Oh, my! 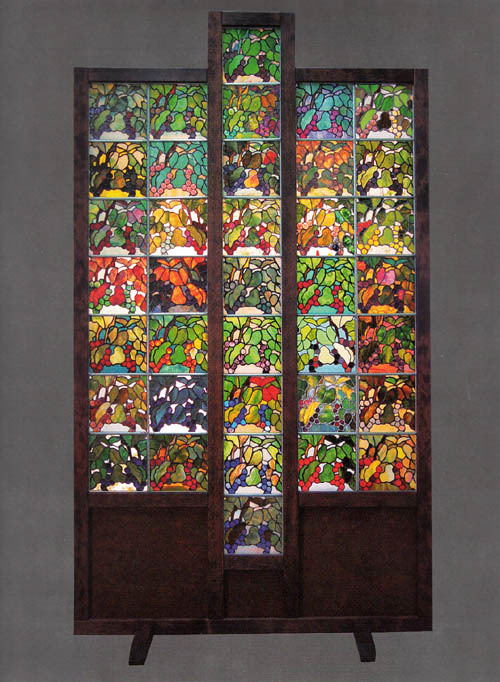 We have plowed back into the stained glass though, and I'm getting panicky about the fact winter is flying by and we didn't get as much done as we wanted. So, do I clean, or do cardio? Lift weights or hoist a dust cloth? Ski or scrub? I know, the correct answer is All of the Above and hurry up about it. He asked me if I noticed the 'skeleton' pattern I'd just made and by golly, he was right. Ok, well this is the most disjointed post EVER. Even Teddy Dog knows better than to bite off more than he can chew. I need to take a lesson from my dogs!